The William D. Gibson company manufactured springs at this factory on Clybourn. Built in 1908, the factory was expanded over the years. Likely designed by one of the masters of Chicago’s industrial architecture such as Alfred Alschuler, the main building does an interesting job of not hiding its water tower. Even with two towers that ostensibly look like they were designed to conceal water towers (an emerging trend at the time), there is still a prominent water tower visible on the roof of the factory. The postcard provides quite a view. Not only does it show the Gibson factory in detail, it shows the natural gas tanks that were notable landmarks of this Near North Side neighborhood for decades. Left: The Gibson complex today. 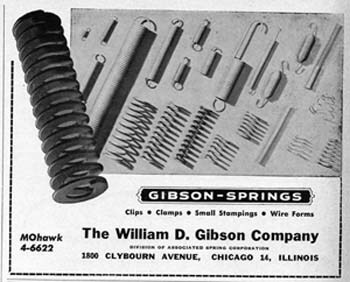 Right: William D. Gibson ad from a 1957 issue of Chicago Commerce. In 1986, the factory was purchased by a developer, Horwitz and Matthews, and became one of the most interesting industrial-to-retail conversions in Chicago history. The “Clybourn Corridor” of lofts and retail was just emerging at the time, and the developer sought to create a unique retail environment. The center part of the building was demolished to make way for parking, with the two ends of the building restored and used for shops. The entire courtyard was intended to be covered by glass, and was supposedly designed to “duplicate the look and feel of a 19th Century industrial village.” 10 Seemingly, some of the plans for the complex (such as the glass canopy) did not come to fruition or were later altered, but the site remains an interesting and unique case study in industrial reuse. This article was last updated on Sunday, July 5th, 2009 at 11:11 pm.